Paiste is celebrating the launch of the new Paiste 602 Modern Essential cymbals by hosting a Paiste Day at Foote's drum store in London on 11 May. This new range from Paiste, which has been developed with Vinnie Colaiuta, will be available to test and Paiste product specialists from Korg, Paiste's UK distributor, will be on hand throughout the day. 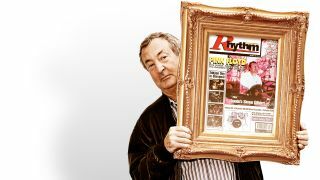 As part of the day, Pink Floyd drummer Nick Mason will be on hand to talk about his love for Paiste metals. For more details visit www.paiste.com and www.footesmusic.com. Questlove explains his new highly-versatileand portable Breakbeats By Questlove Ludwig kit. Great looking kit and some tasty beats to demo it too. Energetic, stylish, acrobatic and in places totally bonkers drum solo from Aric Improta at the 2012 Guitar Center drum-off. Yeah, not bad. This guy's got an interesting set-up. Not sure what his feet are doing, mind. This isn't sexist, by the way, as two of those bottoms belong to men. Yeah, we know, how very modern. Lee Bridges sent us this drum cover medley, of 'Songs I Like At The Moment'. Cool choices Lee, and very cool drumming. If you've done a drum cover you're particularly proud of, or if you've seen an awesome one recently - email us atrhythm@futurenet.com! Finishing up on the June issue (out 7th May) with Ilan Rubin on the cover, we've been giving Paramore's new Number One album, to which he lent his considerable talents, a few spins. It's poppy, alright, but boasts something like 17 tracks, with some tasty drumming from Ilan. We've also been enjoying the Yeah Yeah Yeahs album with Brian Chase back behind the kit - lots of dance-flavoured beats and lo-fi guitars. We also had a first listen of the forthcoming Transplants album featuring, of course Travis Barker, and Tim Armstrong of Rancid. Very cool, nice and punky, and Travis breaks out the cocktail kit for some tasty hip-hoppy beats in the middle.